Our kids are just starting to enjoy board games, really enjoy them. They love the idea of rules, taking turns and especially love games where food is involved. Today, we turned a cutting board and a box of cookies into a homemade game for kids! All you need is painters tape. Be sure to use the cookies that are vanilla on one side and chocolate on the other. And play with kids who are all healthy and you don't mind eating food they touched. Your kids will want to nibble as they play. 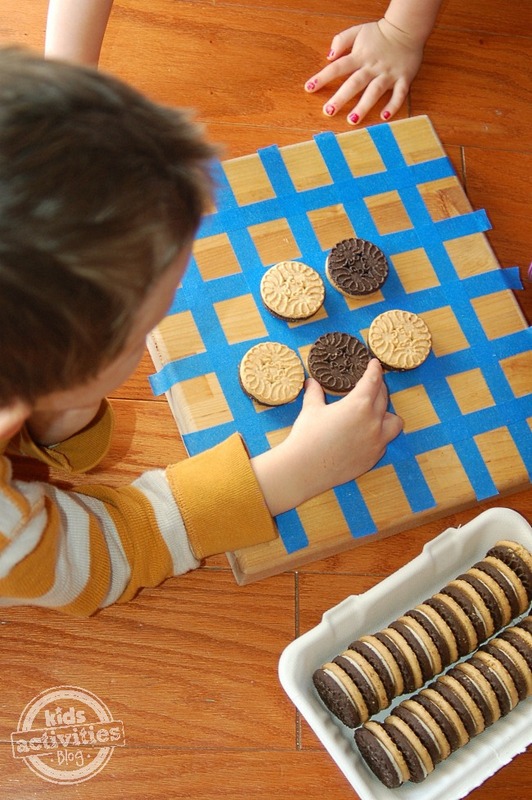 Make a grid with painters tape on your cutting board (or table top, whatever). Try to keep the sections  roughly the size of your cookies. You will want to have an even number of columns and rows (ex: 8×8 or 10×10) for the game to be played most smoothly. Bigger game boards are better suited for older kids. IF your child is new to games, give them a smaller grid. This is the classic game of Othello or Reversi. Basically you start with four cookies in the middle of the board. Each opposing corner being the same color. So if black is in the upper left and lower right, white will be in the upper right corner and lower left. Each child is assigned a color of cookie. They take turns placing their cookie in the grid. The goal is to place the cookie sandwiched  between the same color. For example, if there is a black cookie on the top, a white cookie below it, the child who is black  will want to put that cookie down opposite the white sandwiching  it between the black cookie-tops. When a cookie becomes sandwiched  that person can flip them over, so the white cookie in the middle is turned over to become black. Keep playing till all the sections have a cookie. The person who flipped the most cookies to their color wins. I immediately posted this on Google + after I read it! 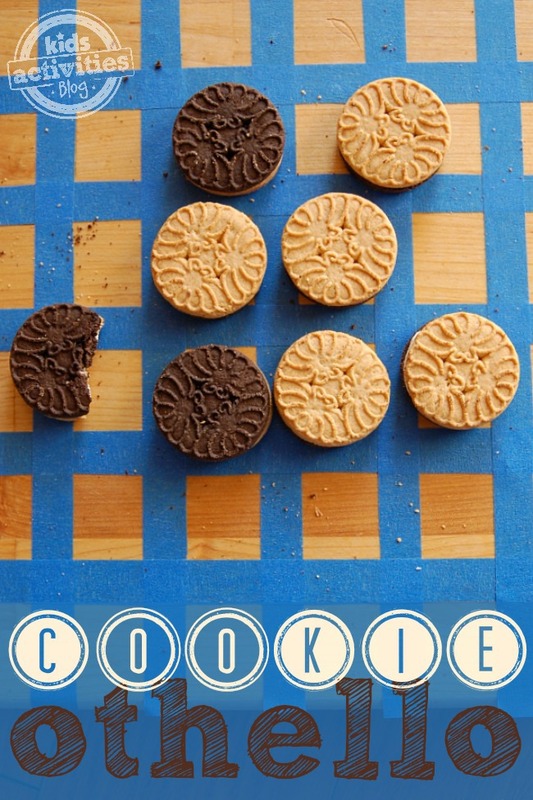 Cookie Othello may just be the best kids’ game post I’ve read in a long time! I love this idea for a fun family game night. Game and dessert in one. Genius! This might be the yummiest game ever! Have fun and don't forget to join us each week! What a great idea!! I loved that game as a child, but never thought to play it with cookies! Thank you for sharing at Sharing Saturday!